Extremely vigorous wine grape that does very well on heavy soil. Highly acidic fruit produces a deep red wine. Hardy to -10F (-23.3C). Pretty purple grapes produce one of the best known wines with high tannin content and a deep red coloring. Hardy to 10F (-17.7C). Spicy flavored red table grape which also makes a flavorful pink wine. Seeded. Hardy to -30F (-34.4C). Produces small spicy pinkish red grapes that are of exceptional wine quality. Unique in flavor. Hardy to 10F (-17.7C). Early ripening black grape with small berries makes a fruity light red table wine. Hardy and productive. Hardy to -30F (-34.4C). Produces large quantities of quality black fruit. Makes an excellent wine. Hardy to 10F (-17.7C). 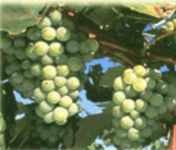 Large white grape used primarily for juice and eating fresh, though it also makes a floral white wine. Good variety for cold areas. Hardy to -20F (-28.8C). Seedless red grape produces large clusters of medium sized fruit. Sweet with a tender skin. Cold hardy. Hardy to -20F (-28.8C). Late fruiting grape producing an exceptional white wine. Hardy to -10F (-23.3C). Large loose clusters up to 5lb each. Good table grape and makes a good wine, as well. Hardy to -10F (-23.3C). A grape species native to the southern US, very sweet with tough skins and seeds. Good juice grape. Grows in loose clusters. Hardy to 10F (-17.7C).